Whether you own one dog or ten, a single puddle of urine can soak in and create an awful, lasting smell, so dog urine cleaners are essential to maintain a healthy, fresh smelling home. Why Does Dog Urine Smell? Dog urine is a concoction of ammonia, bacteria, hormones, and uric acid. As the urine breaks down, the ammonia concentration increases and then mercaptans are produced. This is the same chemical compound that gives skunk spray it's long lasting funk. Uric acid contains crystals that are left behind even after the urine has dried. These crystals are reactivated anytime new moisture reaches the area, including humidity. A dog's urine also acts as a scent marker designed to let other animals know this territory is taken. This potent combination gives dog urine its staying power long after the spot has dried and is the reason specialized dog urine cleaners are so indispensable. Dog urine can also leave a stain on carpets, furniture, and clothing, depending on how concentrated the dog's urine is. Some stains are barely noticeable when the urine dries, yet the smell still remains, leaving some pet owners wondering how in the world they can clean what they can't even see. Ultraviolet light, aka black light, allows you to see even the lightest dog urine stains. Just turn off your lights, and shine the black light around the room. 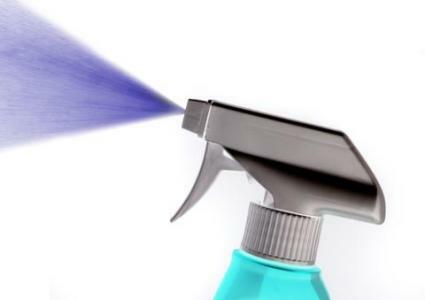 If you've noticed an odor, you should be able to see one or more spots. Clean the spots with whatever dog urine cleaners you choose to use, and you should be on your way to a fresher smelling home. Odorcide 210 is a product that absorbs into the affected area, bonds with the molecular structure of the urine, and inhibits the production of further odors. Urine Gone is an enzymatic cleaner that literally eats the organic matter causing the smells and stains. Urine-Off is another enzymatic product that works directly on urine crystals. Nature's Miracle removes pet stains and odors, and it helps stop dogs from returning to the same places to soil again. Pine-Sol is a heavy duty cleaner that cleans stains and helps reduce the source of the odors. White Vinegar is the ultimate in natural dog urine cleaners. Blot up as much urine as you can, then completely soak the area with undiluted white vinegar. Be sure to let it soak in well enough to reach all affected layers, including padding and subflooring beneath carpets. Blot the area again and allow to dry. This should take care of the smell and remove any staining. Cat Litter - Pour a good amount of clumping cat litter on the wet spot and allow it to soak the urine up. Clumping litter works best because it can absorb up to fifteen times its own weight in liquid. Follow up with a white vinegar cleaning to remove any lingering stains. Baking Soda is a known odor eliminator. Pour it directly onto the fresh urine spot after blotting up as much liquid as possible. Allow it to sit for several hours and then vacuum. Borax is the same product that was once used as a pre-soak for cloth baby diapers. It is also one of the better dog urine cleaners. Borax helps kill the smelly bacteria and eliminate stains. Rubbing Alcohol is a great disinfectant that will soak into the area that was urinated on, reaching the deepest penetration.